It's good to have some kind of feature that people will remember, and distinguish you from other events... Camden Town Brewery have certainly done that with their Tank Party - a bloody great tank filled with 12,000 litres of beer straight from the brewery, on Saturday 24th August. I suspect that the diving board is a bit of artistic licence, though, but you clearly *need* to attend to find out... There are no tickets, but I suspect this one is going to be very busy! 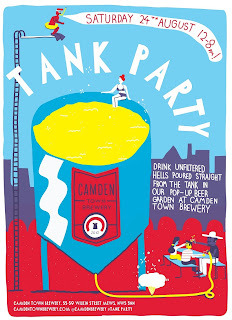 "On Saturday 24 August we're holding a Tank Party. Outside the brewery we have six 12,000 litre tanks all filled with beer and on the 24th we're attaching a tap to one of them and we're going to sell Unfiltered Hells Lager directly from that tank - it'll be the freshest beer in town (and some of the coldest - those tanks are 0C in side!). There will also be lots of street food outside in a pop-up beer garden along the street beside the brewery."